Halloween is around the corner – it snuck up on me again this year! I’m not a fan of running around town to find the best costumes and the best deals, so I can appreciate a one-stop-shop like Party City. Being a happy customer of theirs for years (they have everything I need for my kids’ birthday parties), I was happy to accept the opportunity to sample their latest Halloween costume offerings. 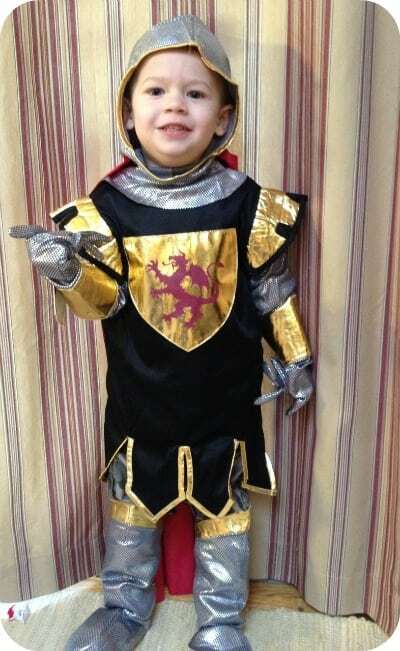 Party City sent two knight costumes for my oldest son (who is very into knights lately thanks to a new television show on the local kids’ station). The first costume is a Party City exclusive – the Boys Brave Crusader Costume. It comes with a tunic, hood, boot covers, cape, gloves and a sash. It is very well made – we’ll certainly get a few Halloweens out of it, not to mention years of dress up play from it! I like that the hood is open and doesn’t obstruct my son’s view (I’m not a fan of masks at his age). He got a kick out of looking like a real live knight. 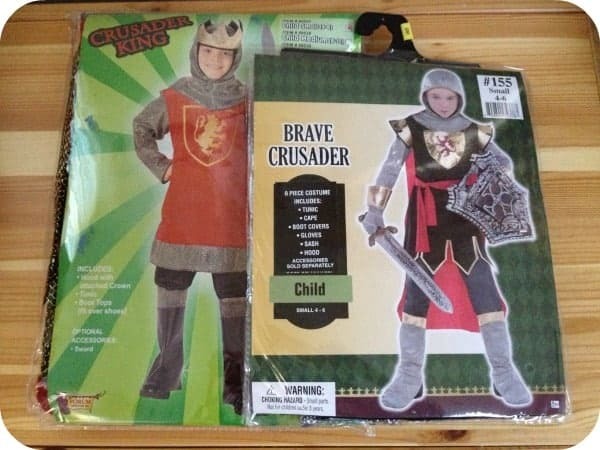 The Crusader costume retails for $24.99. The other costume is called Crusader King, and it is very similar to the knight, except there is a crown on the hood. The King is another great costume for Halloween as well as everyday dress up fun. My husband and I were sent two fun (and super simple) costumes for joining in on the Halloween fun this year. My husband will be a Zombie Groom. All we’ll need to add is a little make-up and he’ll be the perfect zombie! At $49.99, this costume is a little pricey, but the quality of the material means that we’ll get a few years worth of Halloween use out of it (after all, zombies never go out of style! ), so it evens out in the end. My costume is cute and simple and is something that my oldest son gets quite a kick out of – a Sassy Black Angry Bird. The simple black dress makes it easy to layer on cold Halloween nights and the little feather headband is the perfect little accessory piece. This costume retails for $29.99. Party City carries so many styles of costumes to fit everyone’s tastes and budgets. From Disney princesses to classic horror and gothic get-ups, from infants to pregnant women, you can find something for everyone in your family. 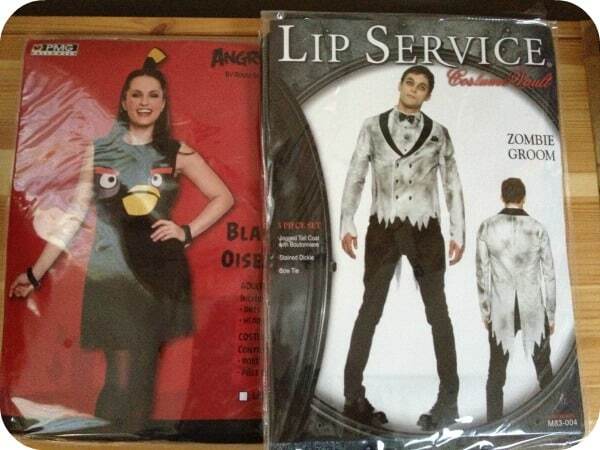 You can choose from hundreds of costumes on the Party City site, and the great thing is, if you don’t like it, you can return it hassle-free to any store. That’s one of my favorite features of buying online with Party City. If you haven’t picked out your costumes for trick-or-treating fun just yet, head over to your local Party City. You can check out their full line of costume offerings online, and while you’re on their site, sign up for their email list for special deals and coupons. You can also keep up with everything happening at Party City on Facebook, Twitter, Pinterest and YouTube. It is a great store for costumes. They have a large selection and plenty of different sizes. We have one Party City store where I live, and I have gong in there after the Holidays are over and got marked down items so cheap. I got some marked down Halloween stuff last year for nearly nothing! I love going to this store because of all the interesting items I can find! I have never been to this store, but it looks like an easy solution for Haloween costumes! I do believe they have much more than that to offer. Sounds like a great store for Halloween time! They have great costumes, it has snuck up on me as well, I’m far from ready. Those are some stellar costumes!! !